This set of Machine Kinematics Questions and Answers for Experienced people focuses on “Velocity and Acceleration of a Particle Moving with Simple Harmonic Motion”. 1. A body is said to vibrate with simple harmonic motion if its acceleration is proportional to the distance from the mean position. a) Its acceleration is always directed towards the center, known as point of reference or mean position. b) Its acceleration is proportional to the distance from that point. The maximum displacement of a body from its mean position is called amplitude. Explanation: The number of cycles per second is called frequency. It is the reciprocal of periodic time. 4. The amplitude of vibrations is always ______________ the radius of the circle. 5. The time taken by a particle for one complete oscillation is known as periodic time. where ω = Angular velocity of the particle in rad/s. Explanation: The number of cycles per second is called frequency. It is the reciprocal of periodic time. Hence, when it is multiplied it is equal to one. 8. The acceleration of the particle moving with simple harmonic motion is ____________ at the mean position. Explanation: The acceleration of a body is zero at the mean position and maximum when x = r.
The velocity is maximum at the mean position i.e. when x = 0. 10. When a particle moves round the circumference of a circle of radius r with ω rad/s, then its maximum acceleration is ω2r. Explanation: Maximum velocity vmax = ωA where ‘ω’ is the angular frequency and ‘A’ is the amplitude. Therefore vmax = (2π/T)A = (2π/2)×50×10-3 = 0.157 m/s. Explanation: The magnitudes of the velocity and acceleration of the particle when its displacement is ‘y’ are ω√(A2 –y2) and ω2y respectively. Equating them, ω√(A2 –y2) = ω2y, from which ω = [√(A2 –y2)]/y = √(4 –1) = √3. Period T = 2π/ω = 2π/√3. 13. Suppose you place a sphere of mass ‘m’ and radius ‘r’ inside a smooth, heavy hemispherical bowl of radius of 37r placed on a horizontal table. If the sphere is given a small displacement, what is its period of oscillation? Explanation: The arrangement depicted in this question is similar to that of a simple pendulum. Instead of the usual string, you have a concave surface to confine the bob (sphere) to its path along the arc of a circle. The usual expression for the period, T = 2π√(L/g) holds here also, where the length L = 36r since the length of the pendulum is measured from the centre of gravity of the bob. The point of ‘suspension’ is evidently at the centre of the hemispherical bowl. The correct option is 12π√(r/g). Explanation: The velocity is the time derivative of displacement: v = dy/dt = -Aω(sin ωt + π/4). Its maximum magnitude equal to Aω is obtained when ωt = π/4, from which t = π/4ω. Explanation: T = 2π√(m/k) where ‘k’ is the force constant, the solution becomes quite easy. From this, k = 4π2m/T2 = 4π2 ×5×10-3/(π/5)2 = 0.5. Since ‘k’ is the force for unit displacement, the maximum force is k times the maximum displacement (amplitude). Therefore maximum force = kA = 0.5×0.3 = 0.15N. 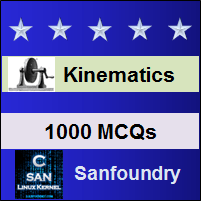 To practice all areas of Machine Kinematics for Experienced people, here is complete set of 1000+ Multiple Choice Questions and Answers.